Joyetech Unimax 25 Starter Kit Review - Daily Vaping Deals & The Best Vape Product Reviews at Vaping Cheap! Joyetech is known for releasing pretty solid vape starter kits for both the beginner and advanced user. They often bring excellent performance, and are quite affordable as well. In this review, we will be taking a look at the newest kit to be released, the Joyetech Unimax 25 Starter Kit. Before getting any further, I would like to thank Heaven Gifts for sending this product my way for the purposes of this review. I will go over my first impressions, usage, performance, pros and cons, and conclude with whether I recommend this starter kit or not! Check out the Joyetech Unimax 25 Starter Kit Here! Click Here to Check Out the Joyetech Unimax 25 Starter Kit! Use Coupon Code ACHEAP15 for 15% Off Your Purchase! The Joyetech Unimax 25 comes in a relatively simple packaging, and it shows you right away what is included in this starter kit, which is the Unimax 25 battery and the Unimax 25 Atomizer. Upon sliding the packaging open, you are greeted with the entire kit, and it is well protected, which is surely a good thing. There are a wide variety of colors available for this kit, I did receive the silver and black color. My first impressions of the Joyetech Unimax 25 Starter Kit was that it’s pretty large, and it is to be expected since it is the 25 version. There is a 22 version that is smaller, so if you do think this vape starter kit is too large, then that’s one to definitely check out. 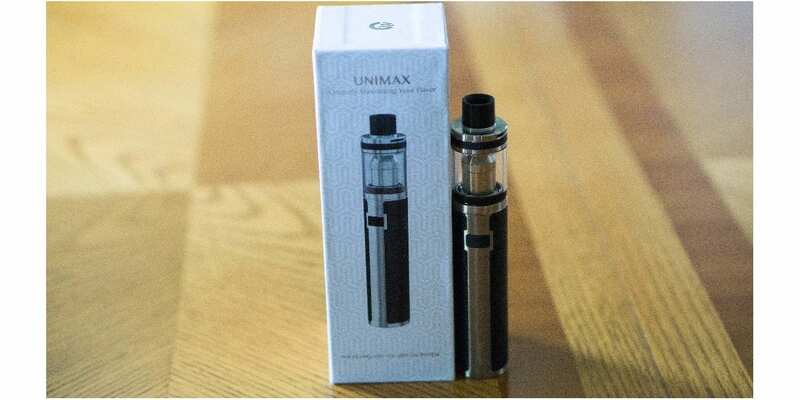 Both the Unimax 25 battery and Unimax 25 atomizer sport an overall diameter of 25mm. Underneath the Joyetech Unimax 25 starter kit is where you find all of the extras that are included which are some replacement stickers, an additional coil head, a spare glass tank section, a micro USB cable, a user manual and warranty card. It’s definitely a huge pro that they include all of these extras, especially the extra coil head, and replacement glass tank section. The Joyetech Unimax 25 battery features a simple one button design, so five clicks to turn it off and on. Also, when the device is powered off, you can hold the power button to change the mode it is in. There are two different firing modes which are constant voltage output and direct output. You will know which mode you are in, because one of them will glow red while the other will glow white when you push the fire button. Also, this device has a large 3,000 mAh battery, and can be charged via micro USB. The minimum firing resistance of this battery is 0.15 ohm. The Joyetech Unimax 25 Atomizer is primarily constructed of stainless steel and glass. This sub ohm tank does feature fully adjustable airflow, and it is quite easy to adjust. 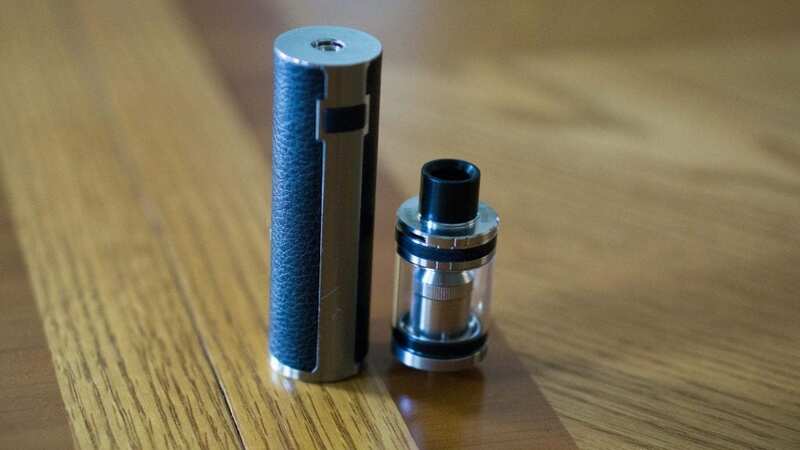 In addition, it includes a wide bore delrin drip tip, which can come off by rotating it. When you rotate the drip tip, you do here a click, which will indicate whether it’s in place properly. You can use your own preferred 510 drip tip when you take off the included drip tip, but honestly it wouldn’t look great due to the way it’s designed. Included with the Joyetech Unimax 25 Starter Kit you do receive two 0.5 ohm coil heads. I already knew that the vape experience would be much cooler since the Unimax 25 battery is unregulated or fixed to a specific voltage, and with a 0.5 ohm coil head, you won’t be pushing much wattage due to its higher resistance. I do want to mention that the Joyetech Unimax 25 Atomizer came clean, and one wash with warm water and this tank was good to go! Also, the tank was easy to come apart for cleaning. All in all, my first impressions of the Joyetech Unimax 25 Starter Kit were positive! 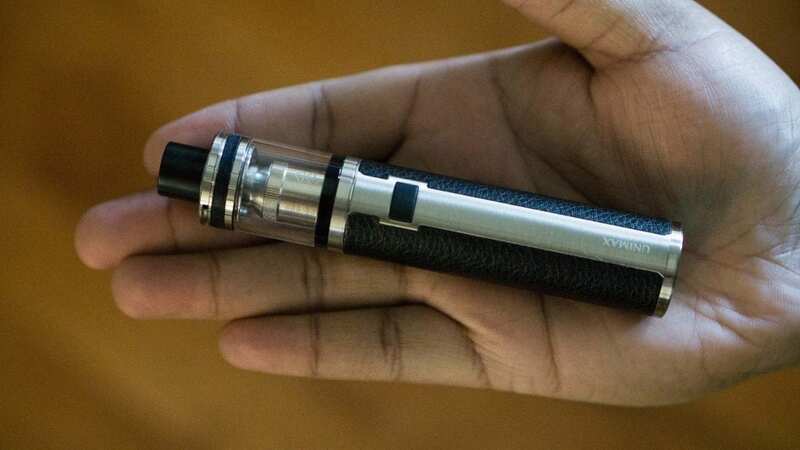 Like mentioned previously, the Joyetech Unimax 25 Starter Kit is quite large, especially since the overall diameter of this entire kit is 25mm. With that being said, it’s not the most pocket friendly kit available, but it does fit in my pocket with no issues. However, this may be different for everyone. If you’re looking for something compact, then you’re just better off with the 22 version or with another vape starter kit in my opinion. I do want to mention that it was comfortable to use this starter kit. It feels great in the hands, and the overall quality is fantastic. In addition, I do like the overall design of the kit, it just looks great in my opinion. Also, since the tank itself is quite tall, this is what makes it feel even bigger in my opinion. If the tank was just slightly shorter, it might not feel or look so large. If this was the case, then the e-liquid capacity would be less, but I would be okay with that to be honest, as I much prefer compact devices, especially when taking them out with me. This, of course is subjective. This is not the largest tube styled kit that I’ve come across, but it’s certainly among the bigger devices for sure. I am glad that they offer two different versions, as some people like myself, will just prefer something more compact. However, I do want to mention even though it is larger, you do get a ton of battery life. I could easily get through most, if not all through the entire day of vaping with this kit. In addition, the Unimax 25 Atomizer has a large 5ml e-liquid capacity, and with this much e-liquid capacity mixed with a 0.5 ohm coil head, you won’t be filling too often. Even when you do need to fill, it can be done quickly since it does feature a top fill design. Using this vape starter kit is very easy as well, as there are no controls, just a fire button. In my opinion, this is perfect for the beginner who is now just getting off of cigarettes. Simple to use, large battery and large e-liquid capacity, it’s certainly attractive to the new vaper. Even changing throughout the two different modes can be done quickly. Simply turn off the device with 5 clicks, hold down the fire button until the fire button lights up the opposing color, and 5 clicks to turn it back on. Once again, this is just perfect for the beginner vaper who’s looking to get off cigarettes, or for the vaper who loves simplicity. All in all, using this device was a solid experience. 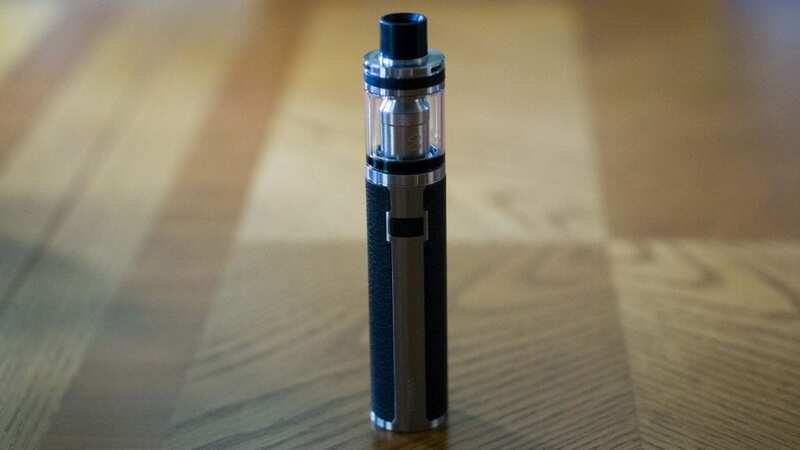 Even though it is on the larger side, it is simple to use, and offers great battery life, which is something a smaller and more compact kit may not offer. The performance of the Joyetech Unimax 25 Starter Kit was great! I do want to mention right away that I much preferred to use this device in direct output mode rather than constant voltage output mode. The reason why is that when the battery is fresh, you will get slightly more wattage since it will provide you power depending on the battery life and diminish after the battery starts to drain. However, if you like a steady and more consistent vape experience, then you’d probably like the constant voltage output mode better. The Unimax 25 battery works just as it should, and there really isn’t much to be said about it honestly. Like mentioned previously, it’s extremely easy to use due to its simple one button design, and will fire down to a 0.15 ohm resistance, and it does as I have attached a different atomizer with this resistance and tested it. The battery life is excellent, and it can be fully charged in about 3 hours or so when fully depleted. I experienced literally no issues with the Unimax 25 battery. The Joyetech Unimax 25 Atomizer is a good performing sub ohm tank, especially if you like a cooler vape. The airflow is nice and smooth, and can be easily adjusted. I did prefer to close off the airflow about a quarter of the way, as this provided me with a bit more restriction. When the airflow is wide open, it is quite airy. With the airflow closed off a bit, you do get a restricted lung hit, and the flavor does increase a bit as well. The flavor on this atomizer with the 0.5 ohm coil heads is good. It’s not the best flavor I’ve ever had nor is it the worst, it’s right in the middle in my opinion. I do wish that Joyetech included a lower resistance coil head with this kit, so it would suit multiple vaping styles. The vapor production with the 0.5 ohm coil head was pretty good as well, not the greatest, but it was satisfying. With the 0.5 ohm coil head, the vape is on the cooler side. I do prefer a warmer vape, so if you’re someone who also likes a warmer vape, then you probably wouldn’t like the performance of this kit. Also, if you are chain vaping, the coil head seems to have issues keeping up. With thinner e-liquids there wasn’t any issue, but I did notice some dryness with thicker e-liquids when chain vaping. Also, I did experience some spitback, but not to the point where I got annoyed or felt it was a huge con, but still something to mention regardless. All in all, the performance of the Joyetech Unimax 25 Starter Kit was good. However, the vape from the included coil heads really aren’t for me as the way I prefer to vape is much different. I do think vapers who are new or who prefer cooler vapes will absolutely love the performance of the Joyetech Unimax 25 Starter Kit. In conclusion, the Joyetech Unimax 25 Starter Kit is a solid starter kit for the beginner or vaper who prefers a cooler vape experience. As mentioned previously, this starter kit really isn’t for me as the way I vape is much different. However, I do enjoy using the Unimax 25 battery with a different atomizer and lower resistance build! There really isn’t too many cons to be mentioned. I did experience minor spitback and some dryness with thicker e-liquids, but not a total dry hit. Honestly, none of these cons are deal breakers in my opinion. Also, the larger size is subjective, and there is a smaller version available if you are interested in this kit. This is subjective as well. Plus, since it does have a larger size, you can expect excellent battery life, and more e-liquid capacity, which is a great trade-off. The battery life will get you through most of the day easily, which is a huge pro. Even though this is not a vape starter kit for me, I still think it’s a great kit for the beginner, as it’s very easy to use and will easily last them throughout the day, which is crucial for the new vaper, so they don’t go back to smoking. All in all, if you’re a new vaper looking to quit smoking and start vaping, or a vaper who likes simplicity and a cool vape, then the Joyetech Unimax 25 Starter Kit is a kit I can easily recommend! I hope this review helps you with choosing the best vape kit to fit your vaping needs! If you have any questions or comments, feel free to leave them down below! Thanks for reading!